At last, I have a finished object to share. And I’m doing it on a Friday. For some reason, I have issues hitting Friday with my finished object posts. And yes, I could schedule them so that they are published on Fridays…but I’m an antsy poster. When I have a post written IWANTITPOSTEDNOW. I’m impatient like that. I don’t have big issues with immediate gratification in other areas of my life–it would be tough to be a knitter and have that kind of hang up–but I do with blogging. Ta DAH! It’s Rocky Coast, all done. Finito. I know a few of my readers have been waiting to see the finished photos. Perhaps you’re using me as your guinea pig before taking on this project yourself. I’m OK with that because, know it or not, I use you as my guinea pigs on a regular basis. This whole blogging things is like a guinea pig exchange program. That’s a weird mental image. Did anyone else just imagine a French guinea pig, with a suitcase and a beret, on his way to spend a year with a family of ground hogs in the American southwest? Photos of my Rocky Coast, plus lessons learned. Markers are your friends: Place markers at the beginning and end of your cable pattern in each section. That way, when you’re putting in Raglan increases, you won’t get confused. So are life lines: For the love of fluffy bunnies, put in life lines every few inches. I know this is important, but I seem to have to keep relearning this lesson. Wool stretches when wet. If you plan ahead, this can be a good thing: Be prepared for the wool to stretch more than you expect it to when blocking. 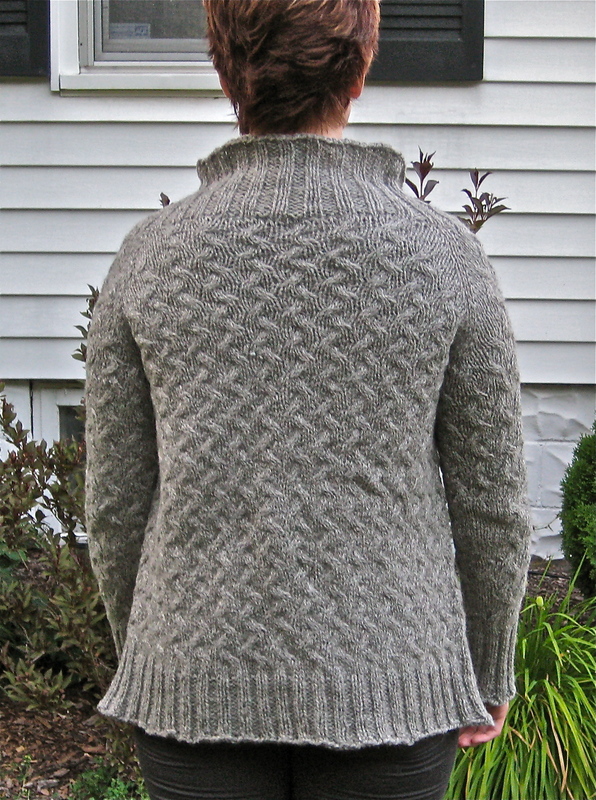 This Shetland stretched out quite a bit, especially in the sleeves. This was a good thing as I wanted the sleeves to be longer and to wriggle a little more room into the shoulders. Sleeves are not supposed to cut off your circulation: Objects knitted in the round don’t always come out at the same gauge as pieces of the garment that are knitted flat. As previously documented in my Rocky Coast saga, I had to re-knit these sleeves four times, experimenting with adding stitches and using larger needles until I found a combination that worked. I don’t think my arms are especially chunky, but no way were they fitting into the sleeves the pattern called for. For the record: This was really, really dumb. 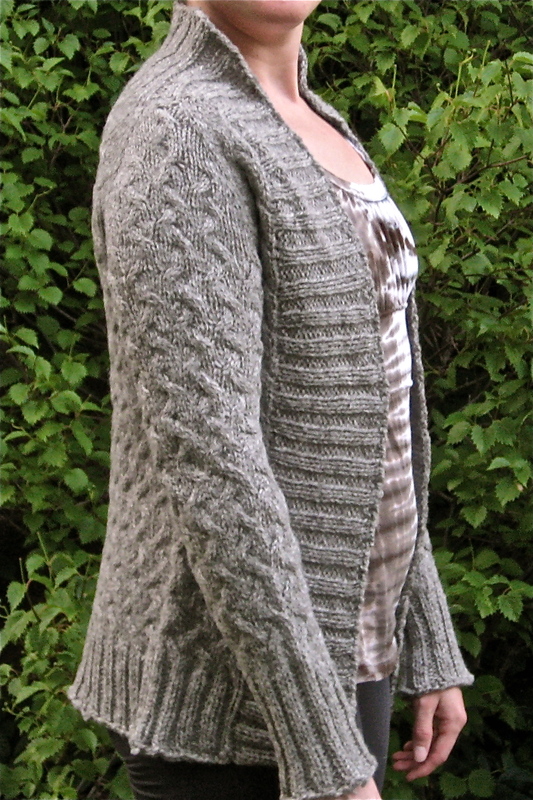 Yarn choice affects everything: For this cardigan, I chose an Aran weight Shetland wool. The yarn the pattern indicates is a worsted weight blend of merino, silk and alpaca. Right from the beginning I knew this choice would have a big impact on my results. I knew the sweater would be thicker, denser and stiffer. Good for outdoor rambles in the fall or an extra layer in January. I don’t think I properly anticipated the way this would affect fit. Given what I know now, I might have chosen to make this cardigan shorter. I’m a pear-shaped chica, so something long , thick and stiff that falls to mid-hip is not always the best choice. I can make it work, but I have to be more conscious of the other clothes I pair it with if I want it to look good. I’ve got to say, though, I loved working with this yarn. Jamieson’s Shetland Heather Aran is a pleasure to work with. Plus, it’s easy to join the ends with the old spit-and-rub trick. Must learn more types of bind-offs: My repertoire of bind-offs is sadly limited. For years, all I knew how to do was crochet bind-off and knit bind-off. Then, last year, I fell in love with Russian bind-off; it’s been my go-to bind off for most projects. 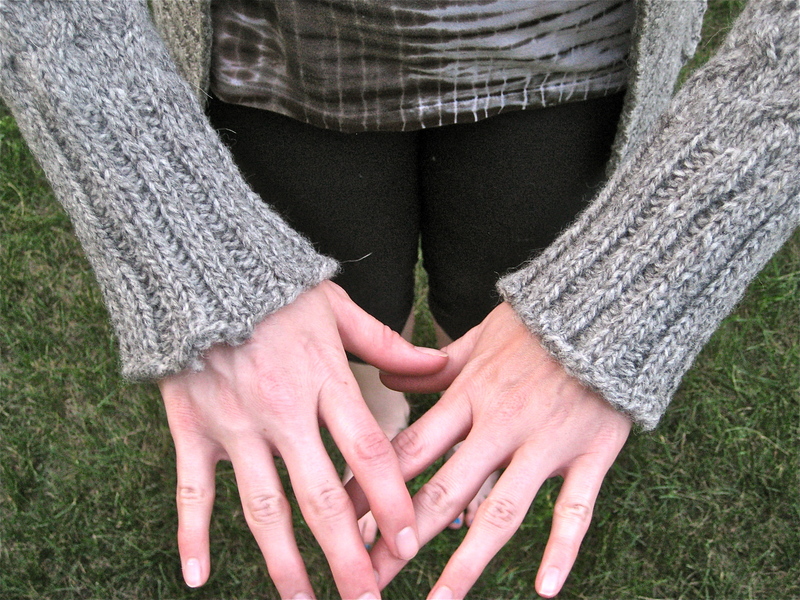 With this cardigan, however, I found I had to be very careful not to let my bind-off get too loose. This is the reason my sleeves are slightly bell-shaped. I paid more attention to this issue on the collar bind off, however, and succeeded in nixing the flare problem. I feel very strongly, however, that another bind off might have been more appropriate. I will need to read up on this. I also welcome suggestions. It is a gorgeous sweater! Your arms aren’t even a little bit chunky. Beautiful and useful. You did a great job! No wonder it’s such a popular pattern.